London Stansted could soon welcome 43 million passengers a year, after a bid to raise its capacity was approved by the local council. The Essex airport wants to increase its current annual passenger cap from 35 million over the next decade, claiming expansion is necessary for vital growth. The airport's application has been approved by the Uttlesford District Council planning committee and will now be considered by central Government. London Stansted is currently the UK's fourth busiest airport, after London Heathrow, London Gatwick and Manchester. 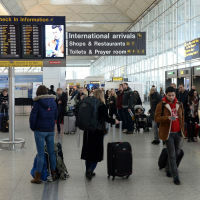 Some 26 million people travelled through Stansted last year and airport bosses expect it to hit the current annual cap in the next four to five years. They claim a limit of 43 million could be utilised without breaking existing caps on flight numbers and aircraft noise. Stansted chief executive Ken O'Toole said the council's decision will lead to 5,000 additional jobs at the airport. He added: "Today's decision offers London Stansted and its airline partners the long-term clarity we need to make further investment decisions at the airport but also, importantly, provides the local community with the assurance that our future growth will be delivered in a measured and sustainable way. "From the outset our local community has been a vital partner in this planning process and it was their feedback which led us to put forward a proposal which did not seek an increase in the number of flights and committed to deliver the growth within a smaller noise footprint than our existing permissions require." Campaign group Stop Stansted Expansion claims that the airport's plans would result in it being able to handle 44% more flights and 66% more passengers compared with last year. It has expressed concerns about the impact of expansion on noise and pollution levels, adding that local residents "stand to suffer so much" from the council's decision. Since Stansted was bought by Manchester Airports Group in 2013 annual passenger numbers have grown by 10 million and the number of routes has increased by 25% to 190. Are you heading off on a city break from London Stansted and looking for travel insurance that meets your needs? Check out our range of dedicated city break travel insurance options today.